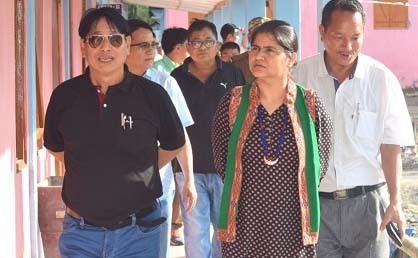 In order to strengthen the education system and meet the aspirations of the children of Arunachal Pradesh, State Education Secretary Madhurani Teotia visited many schools of East Siang district on Tuesday. Teotia was accompanied by State Director Elementary Education, DC, East Siang, DDSE, Dr. David Gao, Assistant Professor, RGU and other officials. Teotia visited GHSS, Ruksin, UPS Mikong and GHSS Sille as well as the upcoming Sainik School at Niglok, which is scheduled to start its first academic session from August 27. Teotia, who spearheaded the delegation, directed the teachers to “maintain self-discipline and devote more time to the students”. Resenting the AISSE results of GHSS Sille, which was around 40%, she asked the teachers to ensure better result in the next academic session. While interacting with the students she also took stock of textbooks, midday meals and directed the DDSE and the principals to conduct counselling programmes for boosting the confidence of the students. Her visit was to access the community partnership initiatives that brought remarkable changes in face-lifting the school infrastructure of these schools since January, 2018. The teaching staff and students, with who she interacted, expressed their gratefulness to the department for visiting the three schools.